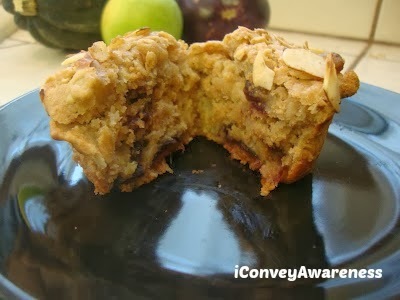 Complements of Abundant Harvest Organics (AHO), I'm sharing their recipe for Apple Fig Muffins that my son and I made (modifications are annotated by an asterisk). Preheat oven to 375 degrees. Combine dry ingredients in a large bowl. Combine egg, yogurt, and butter in a small bowl. Beat together until all is moist. Stir in apples and figs. 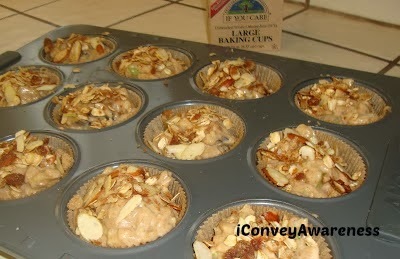 Spoon batter into baking cups using an ice cream scoop to fill. 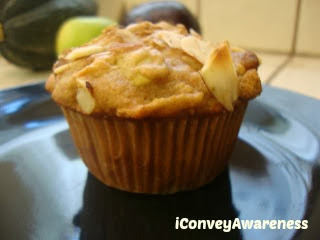 Combine the topping ingredients and spoon over muffins, pressing down in batter a bit. It makes 18 regular sized muffins. Bake in 375 degree oven for 22-25 minutes depending on the size or until toothpick inserted comes out clean. I'm living in a new area as of August 2012. I left sunny "cooler" Southern California for sunny "hotter" High Desert (still in CA). Where I used to live - Temecula Valley (part of the Inland Empire) - there was a plethora of resources, stores, healthy options but where I'm at now, well... this is the reason for this blog post. Over the next several months, I plan on scouting out my local stores, restaurants, and people who are into sustainable, health-minded products and services and are open to sharing resources. As I find them, I will share a post on their business or ask them to collaborate with me for the small business of the month. Though you may not be in my area, it shows that connecting with people is the beginning to relationship building. It is my hope to discover some gems. I'm excited to start this adventure.